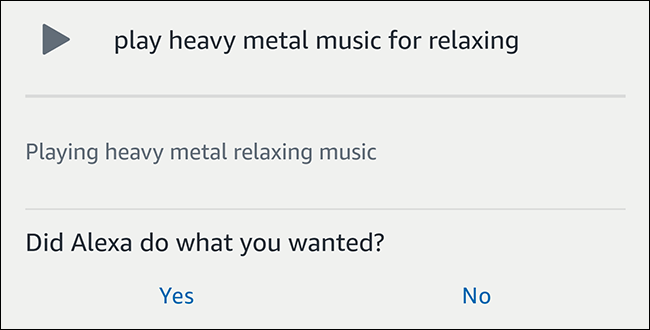 Amazon recently rolled out a feature that lets you ask Alexa for music based on what you’re doing. Amazon even announced that it would be able to “play music for baby-making.” Okay, Amazon. Sure. But what else have you got? I decided to see what other activities I could get Alexa to play music for. Alexa can already handle a lot of voice commands for playing music. She can find music by artist name, song title, playlist title, Pandora-style “stations,” and now curated playlists designed for certain activities. The whole point of all of these commands is so that you don’t have to learn the right syntax or tech-y commands. You just ask Alexa for some music and it gives you the kind of music you want. With this in mind, I set about testing some activities to see if Alexa could find something appropriate. In some cases, Alexa returned a playlist specifically designed for what I wanted to do, other times it would try to take an educated guess at what kind of music I wanted and play a station that seemed close. I counted it as a success if I got music that would totally get me in the mood for whatever I said I wanted to do, whether or not Amazon specifically meant to support that activity. With that in mind, let’s take a walk through my now-tainted Alexa voice history. Why not give Amazon a freebie and start off with an activity the company explicitly confirmed works? I asked for music to make babies to, and Amazon responded “Here’s a playlist for baby making music: Hot, Sweaty Summer Nights.” Whoa. Pump the brakes a little, Amazon. You can’t just dive right in like that. You have to start slow, build up to it. At the very least, this gave me an example of how Amazon handles “supported activities.” Alexa confirmed this playlist was intentionally designed (presumably by a human) to accompany the physical act of love. So, what’s the first song on this playlist? Sign of the Times by Harry Styles. Hrmm. I never claimed to be a leading expert on romance, but opening with a song that contains the lyric “You look pretty good down here, but you ain’t really good” isn’t exactly my idea of setting the mood. Still, if you don’t pay attention to the words, the music sounds pretty nice. Did Alexa do what I wanted? Yes, but with a few asterisks. Officially, baby-making is a supported activity and I got a named playlist intentionally designed to accompany the act. Amazon’s employees and I might just have different taste in baby-making music. Alright, time to get a little more challenging. Dungeons & Dragons is always better with a little music in the background. I figured Alexa could give me a little help for my next campaign. I said “Alexa, play music for D&D.” She responded, “Here’s a station you might like: Shawn Mendes.” Okay, so two things: First, we’ve now learned that when Alexa doesn’t have a specific playlist for an activity, she’ll improvise with a radio station. Second, we’ve learned that Alexa would make a terrible DM. Maybe it’s my fault, though. I tried a second time, spelling it out clearly. “Alexa, play music for Dungeons & Dragons.” This time we got something a little more appropriate. She started playing the Dungeons & Dragons official roleplaying soundtrack. Technically, that fits, but I worry she’s being overly literal instead of actually thinking about my request. Still, if I wanted to be picky about my campaign’s soundtrack, I should select my own songs instead of complaining about my ineffective robot assistant. Did Alexa do what I wanted? While it’s not super creative, this is still technically a success. 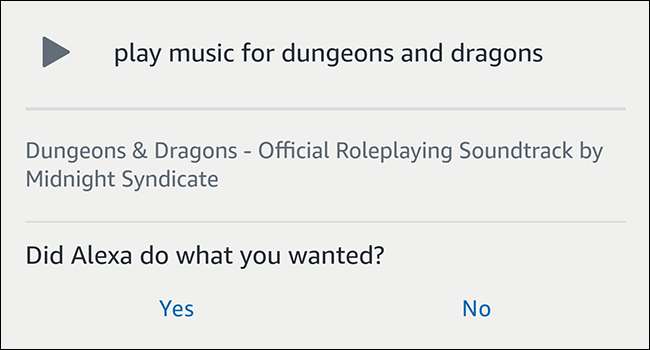 Until the throngs of Amazon engineers who undoubtedly also run D&D groups want to share their playlists with the rest of the world, I think this is the best we can hope for. At the request of my colleague Justin, I asked Alexa if she could play music appropriate for storming the castle. She only did okay at giving me a soundtrack appropriate for pretending to storm a castle, so I didn’t expect much. However, Alexa helpfully informed me that I could unlock Storming the Castle with Amazon Music Unlimited. Which, you know, makes sense. It costs a lot to finance a war, and you don’t want to go storming a castle with nothing but a wheelbarrow, a cloak, and your wits, now do you? Did Alexa do what I wanted? Not without shelling out an extra $7.99 a month on top of Amazon Prime. Frankly, I shouldn’t need to spend extra money to get music basic, everyday tasks. I asked Alexa to “play music for practicing kung fu moves.” She told me to stop being such a nerd, but then she did start playing some music. First, she plays the Kung Fu Fighting cover by Cee Lo Green and Jack Black for the Kung Fu Panda movies. Alright, I’m a little impressed. However, as the playlist went on, it started playing some bad covers of songs like Beat It and Eye of the Tiger. Out of curiosity, I checked out the queue in the Alexa app. What I found confused me. 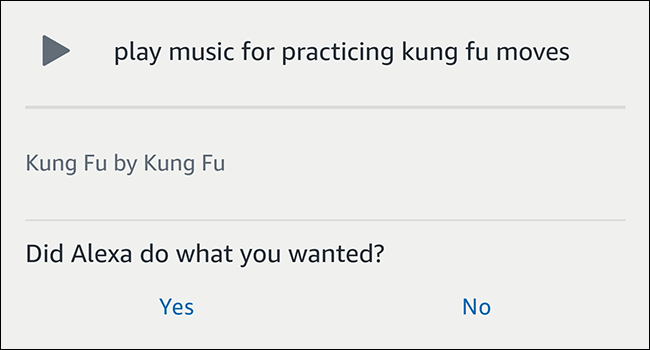 Alexa had started playing an album called Kung Fu by Kung Fu. The listing said most of those bad covers were made by a band named Panda. While Panda is a real band, they didn’t make any of these songs. The album also included several tracks of Kung Fu sound effects, but they were locked behind a Music Unlimited subscription. Weirdest of all, the album had multiple reviews recommending that I “SEE THIS BAND LIVE ASAP.” Man, you just haven’t lived until you’ve heard “Monkeys, Tigers, Birds, Lions (Fighting Sounds)” performed live on stage. Did Alexa do what I wanted? I asked for kung fu music and I got a spammy, probably illegal album of bad covers and stolen tracks pumped full of Kung Fu Panda SEO. But that first song was pretty good. D+. Suspecting that my relationship might not last much longer if I keep asking Alexa to play music for ridiculous tasks while my girlfriend was in the room, I decided to get a head start and ask Alexa for breakup songs. 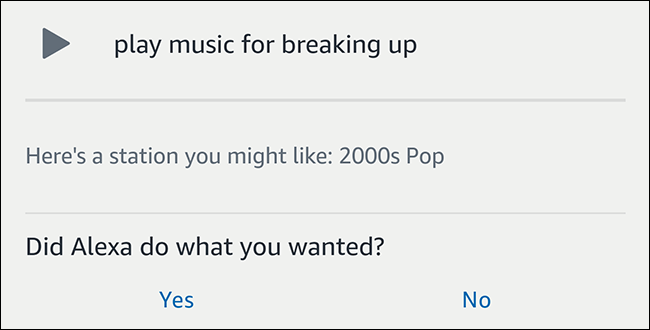 She came back with a radio station—implying no one at Amazon made a breakup music playlist, which seems like a bit of an oversight—of 2000s pop music. The opening track was Hips Don’t Lie by Shakira. Not exactly what I expect when I think of sad break up music. I tried asking a second time to see if I’d get a different result. She started playing Shawn Mendes. What do you think this is, Alexa? A D&D campaign? Did Alexa do what I wanted? No. She kept trying to force me to listen to happy music instead of letting me be sad. Amazon should probably have Alexa watch Inside Out. If Alexa’s going to be a true personal assistant, she needs to handle uniquely human problems. Like lying awake at night, fending off the torrent of worries and fears about the nature of your existence in a cold, empty, and unconcerned universe. Hey Alexa, got any music to go with that? 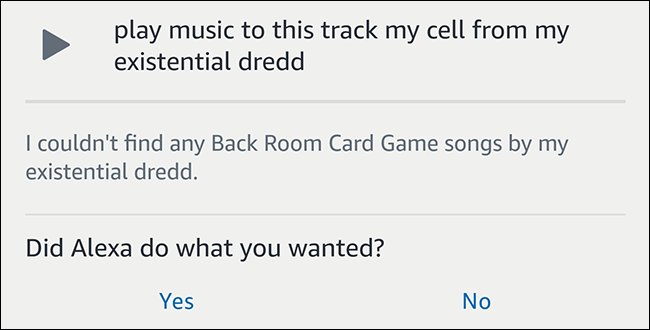 Alexa misunderstood my request and said she was unable to find any Back Room Card Game songs by “my existential dredd.” Hold the friggin’ phone. Back room card games?! Is there a seedy black market where Yu-Gi-Oh players compete in illegal tournaments or something? And if so, Alexa, could you find me one? Also, I’m really disappointed that My Existential Dredd isn’t a real band. They would rock so hard. Did Alexa do what I wanted? Well, she didn’t play any music, but I came away from her response with a whole lot of questions that don’t keep me awake at night, so I’ll call it a win. 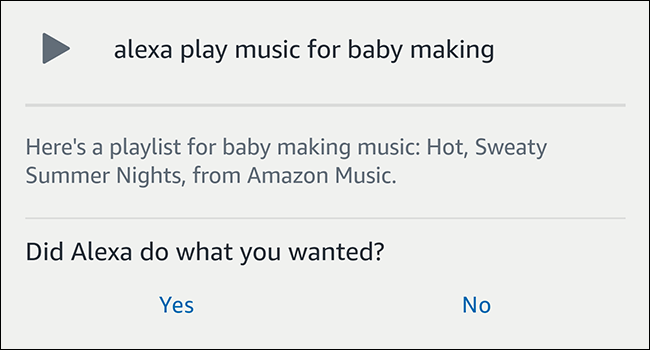 Amazon boasts that not only can Alexa find music for certain activities, but you can pick which subgenre you want, like “jazz music for hooking up.” So, let’s see just how creative she can get. I asked Alexa to play me some heavy metal music for relaxing. You know, in case your idea of relaxation involves less Mozart and more Mastodon. To my surprise, Alexa delivered with zero qualifications. First up was Damage Inside by Machine Head. While distinctly metal, this track was soothing enough that I could see chilling to it in a recliner. Many of the songs she played seemed to be the one-to-two-minute tracks in between other songs on the album, but they all blended nicely together. They were legitimately chill while still distinctly metal. Did Alexa do what I wanted? Yes. Amazingly, Alexa curated a station of metal music that was easy enough to take a nap to. Alexa was able to find music for both reading and writing. She chose some classical music for reading, but some electronic music for writing. This is probably the most intuitive Alexa got in my tests. Asking Alexa to “play music for making dinner” yields no results, but “play music for cooking” did. I thought maybe she couldn’t handle such specificity, but when I asked her for “music for breakfast,” she was ready with the playlist “Ease into Morning: Acoustic.” So, apparently Alexa is more of a morning person. I asked Alexa to “play music for gaming.” She started a station of Video Game Music which is pretty on the nose, but it made me realize that whatever game I’m playing has a soundtrack that’s already tailored to the game. Maybe I should just use that. Overall, the new activity feature is neat, but it’s a little hit or miss. However, it’s just one arrow in Amazon’s quiver. If you need some background music that fits whatever you’re doing, Alexa can probably find something appropriate. Or she’ll play Shawn Mendes. Hope you like him.